Sherrie this is just beautiful. Love those skittles and pretty ribbon. Everything comes together perfectly. Hoe your weekend is grand sweet lady! What a beautiful card Sherrie! LOVE all the added details on your card! 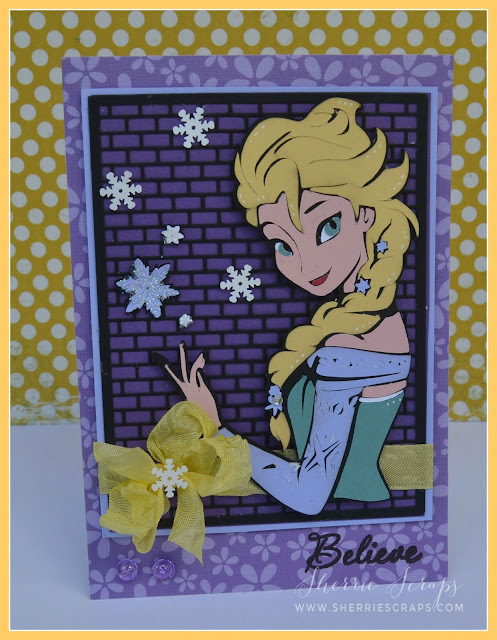 Perfect for that Frozen loving kiddo!!! Happy Friday my friend! Hope you have a GREAT weekend! Oh my gosh, this is gorgeous, Sherrie!! Elsa looks so beautiful!! I love the colors you used for her!! The purple background is so striking!! I love how it looks like she's flicking those snowflakes in the air!! What a stunning card my friend!! You are really going to force me to watch Frozen to see all of these awesome characters!! Love, love it my friend!! OMGoodness, I love this, that brick in the background really makes it pop!!! GR8T JOB SHERRIE!! Beautiful job, those cuts look really intricate! Well done! Gorgeous card, you did an amazing job on Elsa! The colors are fabulous! I also love the gorgeous background! Have a great weekend! I was contemplating on getting that cartridge too, but I'll wait on it for now.... love the card though, its really cute! Oh this is so awesome!! She looks so perfect and love the papers! Wow wow wow!! This is gorgeous! LOVING Elsa!!!!!!!! So very pretty Sherrie! She is beautiful! Absolutely Gorgeous!! Gorgeous ribbon my friend!! Adore the pretty snowflakes! I just asked William for that cartridge..lol! This is so beautiful ! I am so in love ! Sherrie I so love this card. Love the colors the brick wall.. shoot lets just say I love the whole card. Thanks for linking up over at PDE Linky Party Would love to have you link up over at 2 Creative Chicks too. 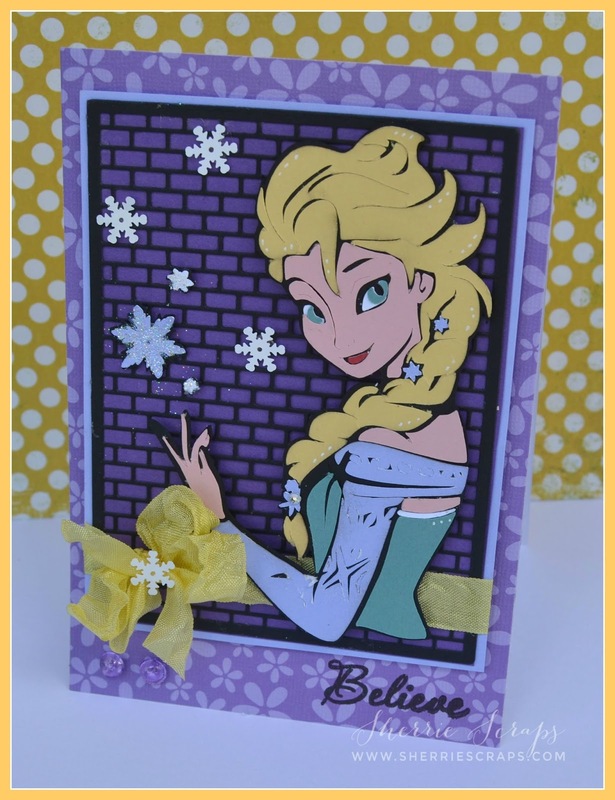 Yes you can link cards up over at 2 Creative Chicks now. Love your beautiful card Sherrie.......I can see why the brick die is you new favorite, it looks fabulous! 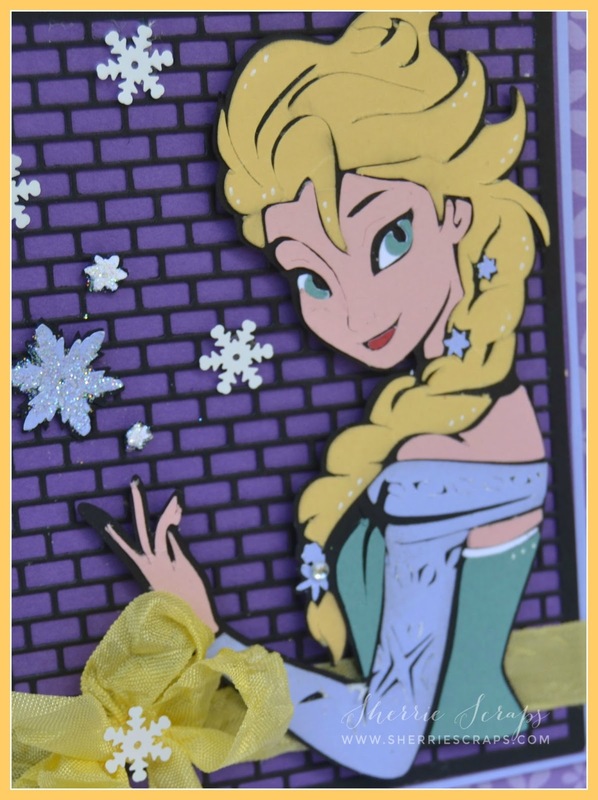 This card is just gorgeous, great job Elsa!! Absolutely beautiful!! I must have been under a rock... didn't know their was a Frozen cartridge! Oh my Sherrie ~ you are using this cartridge PERFECTLY!! I love seeing all your creations with it! I adored this movie!! Oh my the bricks again ~ I may need these! !